With history stretching back millennia to the native Cherokee, East Tennessee's history is far from boring! Throughout the region, visit the numerous historical landmarks in the Smokies that are scattered in the hills. Those looking for interesting things to see in the Smoky Mountains will not be disappointed in touring these pieces of East Tennessee's past. From log cabins, ghost towns, and mills, these buildings have stood through the centuries and provide pieces of history visitors can touch. Visit the cabin of 5 stubborn sister who refused to give up their property to the National Park service. Eat a restaurant with a historic working mill. The collection of stories told by these historic landmarks in the Smokies are sure to delight the history enthusiast. Come unlock the rich history of Appalachia today at this historic Smoky Mountain Sights. Those staying in cabins in the Smoky Mountains will appreciate the comforts of there modern accommodations even more after learning of the trials and tribulations of the area's first European settlers. Located in Roaring Fork, out of all the things to see in the Smoky Mountains, this cabin paints the best picture of what diverse skills you needed to survive in the wilderness. Alfred Reagan operated community's blacksmith shop, general store, and its most consistent grist mill. He even found time to act as a local pastor. This cabin stands out from other historic landmarks in the Smokies with its painted paneling. Those looking for authentic historic places in the Smoky Mountains should look no further than this cabin, which remains largely as it was when the Bales family lived in here in the early 1900s. Located at the base of Cove Mountain, which forms long wall-like ridge that provides a natural boundary between Wears Valley and the national park, this former Appalachian community stands as a testament to life in the mountains. Smoky Mountain sights to see here include Greenbrier school, which was the community school until 1936 as well as a primative baptist meeting house, and the Walker Sister house, where five spinster sisters who refused to sell their 166-acre property to the National Park. White Oak Flats in 1807. It was their wish to honor her recently deceased husband, William and settle in the "land of paradise" he had found for them. That paradise is Gatlinburg. The Ogle cabin was built in that year, and you can still visit it today. One of the most extensive historical landmarks in the Smokies, you'll get a true glimpse of what life as a 19th-centure farmer was like in the mountains by visiting Bud Ogle's cabin, barn, and tub mill. You'll find several historic landmarks in the Smokes that will top your list of things to see in the Smoky Mountains here, including the Noah Ogle Homestead, John Ownby cabin, and Alex Cole cabin. The Old Mill, which now houses the Old Mill Restaurant, is a historic, fully-functioning Grist Mill that produces its own flour. 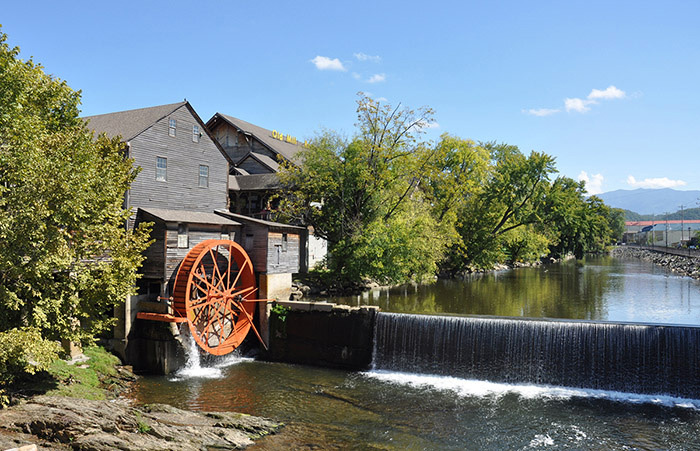 One of the most iconic historical landmarks in the Smokies, the Old Mill has stood as the center of Pigeon Forge since it was built. This bridge was built in 1875 and has been maintained throughout the years. You can even drive over it. Please not that, unlike other Smoky Mountain sights, Harrisburg Covered Bridge rests on private property. Those looking for things to see in the Smoky Mountains from its first inhabitants will enjoy visiting this site. During excavation of the area in 1881, several artifacts were discovered including burials. The land was owned by the McMahan family at the time of the excavation, hence the name of the mound. Discover Historic Avent Cabin in Elkmont inside the Great Smoky Mountains National Park close to Gatlinburg, TN. This cabin is one of the oldest structures remaining in the national park and dates back to 1850. Explore out these awesome facts about Newfound Gap in the Great Smoky Mountains National Park that connects Gatlinburg and Cherokee. A trip to Cades Cove in the Great Smoky Mountains National Park is like taking a trip back into 19th century Appalachia! Discover wildlife, beautiful mountain views, and historic cabins in this picturesque valley in the Smokies!